Nicholas Hawksmoor's Christ Church, Spitalfields has featured heavily in the hidden history of London. It was Iain Sinclair who first mooted the occult influences around the alignment of Hawksmoor's churches, while Peter Ackroyd based a series of ritual murders around the churches in his contemporary set novel Hawskmoor. Alan Moore expanded upon these sources in his seminal graphic novel From Hell, with a conspiracy linking the Freemasons and the Monarchy with the Jack the Ripper killings. On the musical front, I can only think of Into A Circle who sung about Hawksmoor's "phallic limestone structures" on their single 'Evergreen'. Until now I've never known of anyone to record there. 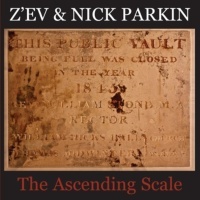 Yet that's precisely what veteran percussionist Z'ev and sound designer Nick Parkin did during several sessions in 2008-9 where they recorded the sounds that comprise The Ascending Scale in the crypt of what is regarded as Hawksmoor's architectural masterpiece . The source recordings were used to compose two finished pieces before varying degrees of electroacoustic processing were employed to transform the material again into two new works. The four pieces were further edited and recombined to become the three tracks that make up The Ascending Scale. The resulting three pieces are quite distinct and clearly composed to make best use of the site's inherent acoustics. Opening with atmospheric noise and eerie tones 'The Smoke' is the noisiest of the three pieces as it bristles with rumbling and rattling percussion, pierced by sudden thuds and shrieks, with passages made up of squeaking strings and plucked notes. The entire piece seems to seek out the cavernous echoes of the crypt through the textural scraping of metal and wood. An eerie atmosphere is invoked from underlying shifting tones, with the percussive tendencies withdrawing towards the end in favour of rattles and gongs. 'The Ash' is much more subdued and pensive with menacing dark ambient drones and reverberating gongs creating a sinister atmo-drone. The overall feel is spacious with low, shape-shifting tones slipping into near silence. It sounds like the entire piece has been designed to resonate with the windowless subterranean chamber. Through passages of harsh cascading (wind) drones and a series of echoing thuds along with spiralling jangle of cymbals it remains dank and malevolent. The final piece, 'The Ash' distils fizzing textures and shifting melodic bowed cymbals with the percussive clatter of drummed metal and the low, low drone of woodwinds.